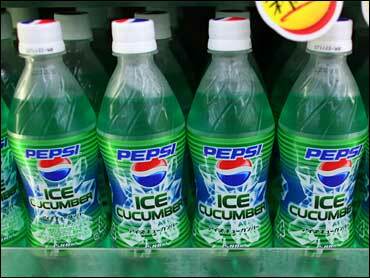 Japanese are staying cool as a cucumber this summer with "Pepsi Ice Cucumber" — a new soda based on the crisp green gourd. The soft drink, which hit stores here on Tuesday, doesn't actually have any cucumber in it — but has been artificially flavored to resemble "the refreshing taste of a fresh cucumber," said Aya Takemoto, spokeswoman of Japan's Pepsi distributor, Suntory Ltd.
"We wanted a flavor that makes people think of keeping cool in the summer heat," Takemoto said. "We thought the cucumber was just perfect." The mint-colored soda is on sale just for the summer and only in Japan, Takemoto said. She said initial sales were brisk, and Suntory aims to sell 200,000 cases over the next three months. Pepsi trails behind industry leaders Coca Cola (Japan) Company, with about 15 percent of the Japanese cola market, and also faces stiff competition from non-fizzy bottled drinks like green tea and coffee, which are popular here. Suntory said it sold 20.5 million cases of Pepsi brand drinks in 2006, including its popular Pepsi NEX zero-calorie soda.